Feijoada (pronounced fay-ZWAH-da) is a traditional Brazilian stew with black beans, beef and pork. it is usually served with rice and assorted sausages, such as chouriço, morcela or farinheira in a clay pot. It is customary to serve it with side dishes such as white rice, couve à mineira, grated collard greens or kale, farofa, roasted cassava flour, fried pork rinds, and orange slices to help with digestion as it is a very heavy dish. Hot pepper sauce (pimenta) made of oil soaked malagueta peppers is also accompanied to the stew to spice it up. Beer, cachaça or caipirinhas are served with feijoada. 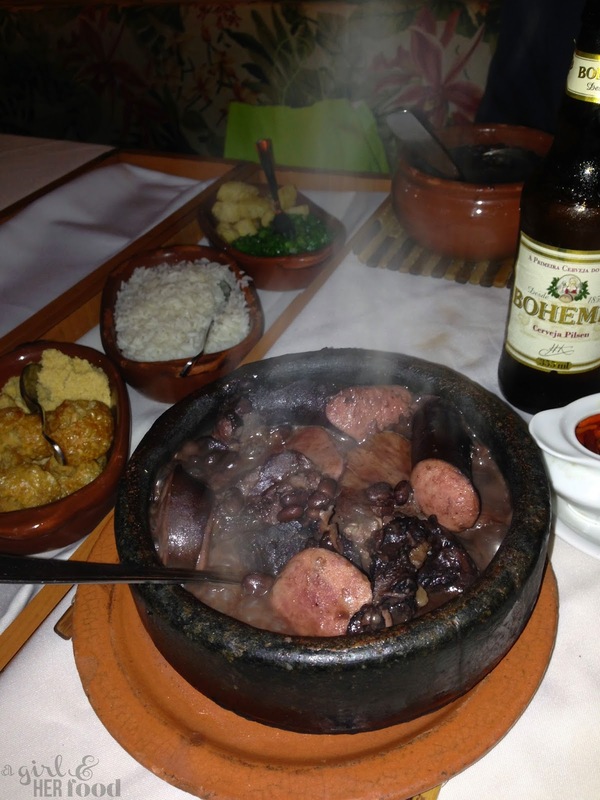 In Rio de Janeiro, feijoada is usually served "full on" on a Saturday and there will be a line forming around 1pm. But no worries if you aren't in Rio de Janeiro on a Saturday as Casa de Feijoada offers the stew every day of the week (steps away from the beaches of Ipanema). Our hotel, Fasano, highly recommended Casa de Feijoada for our rainy Saturday activity as you spend hours enjoying this meal. I have to say it was quite the experience. It's been open since 1989, so they know what they are doing even if it costs about R$73 ($32US) per person. At Casa de Feijoada, you start with a caldo de feijão (bean soup) and they offer you two different types of batida (lime or passion fruit) to help line your stomach for the HEAVY meal that is about to go down. If you want to get a taste of delicious Brazilian cuisine, head to Sportsman's Club this Sunday (4-9pm) as Chef John Manion of La Sirena Clandestina is serving up choripàn and feijoada beans with Palma Louca or a caipirinha for $20!